ClickBook can make PDF files. Choose your layout, and hit the PDF button on the toolbar. Name your PDF file and choose Save. The Save dialog has an option PDF Security... which lets you set an owner password, a user password and set limits on what users can do with the PDF file. Auto Email PDFs - ClickBook will use your default email client to quickly send converted PDF files to friends, family, and colleagues. You can use this feature to quickly email PDF booklets, PDF brochures, PDF banners, PDF posters, and more. Simply click on the email button on the toolbar. Your default email client will open with the PDF as an attachment. You can select the person you would like to send the PDF to, type in a message, and send the email as you always have. 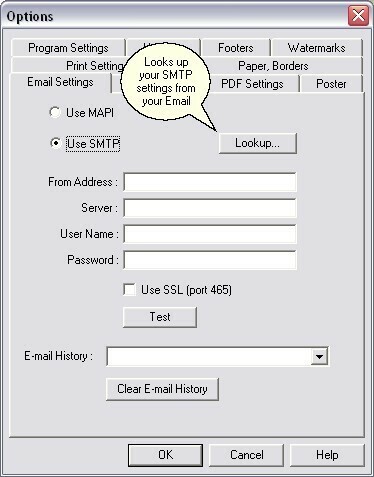 You can now email using your SMTP Server settings. To setup your SMTP Server Settings. 2- Then click on the 'Email Setting' tab. 3- Click OK to save your settings.